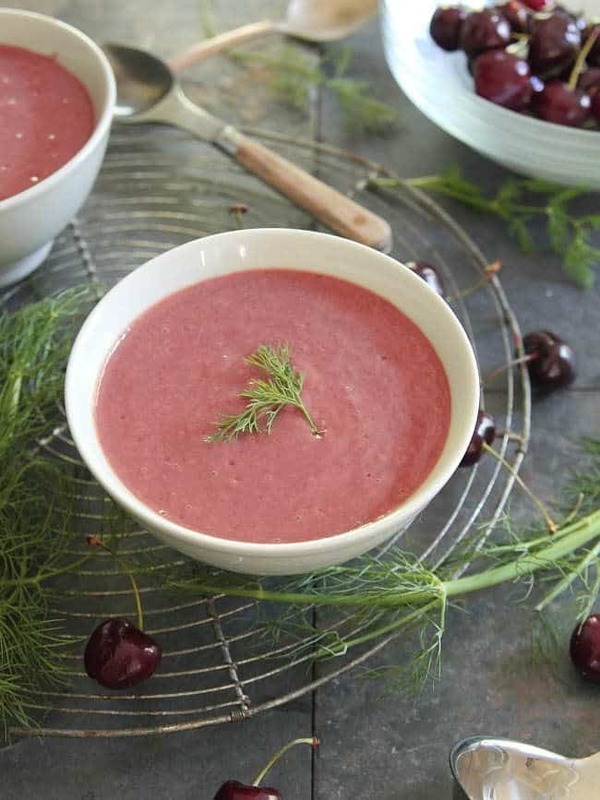 This chilled cherry fennel soup is just slightly sweet with a tangy fennel and dill flavor. This weekend epitomized summer. There was a beer, bourbon and bacon fest that was attended which meant lots of boozing in the sun with friends, delicious bbq consumed afterwards and a stop at a local ice cream joint to cap the day off, an 8pm walk around the neighborhood with the pup in flip flops and 30 minutes spent outside on the deck pitting cherries. Normally, that last one would make me all itchy with impatience. I don’t have a cherry pitter and spending 30 minutes on something like that can easily be seen as a waste of time. Except, this time, instead of being annoyed that I was standing over my sink pitting cherries while the sun shined (shone? that’s a grammar one I’ll never get straight) bright outside, I took the bowl, cutting board and knife outside and decided to enjoy the downtime. Meanwhile, the neighbor kids rode back and forth and back and forth and back and forth our lawn on their motorized Harley looking dirt bike contraption severely testing my ability to savor the outdoor cherry pitting. But, a few deep breaths and forcing myself to remember what it was like to be 10 and fresh out of school for the summer put those stabby old lady thoughts aside. Mightynest wants us to savor the summer with their June Savor the Summer Challenge. The Savor the Summer Challenge is all about enjoying the fruits of the season and making memories. 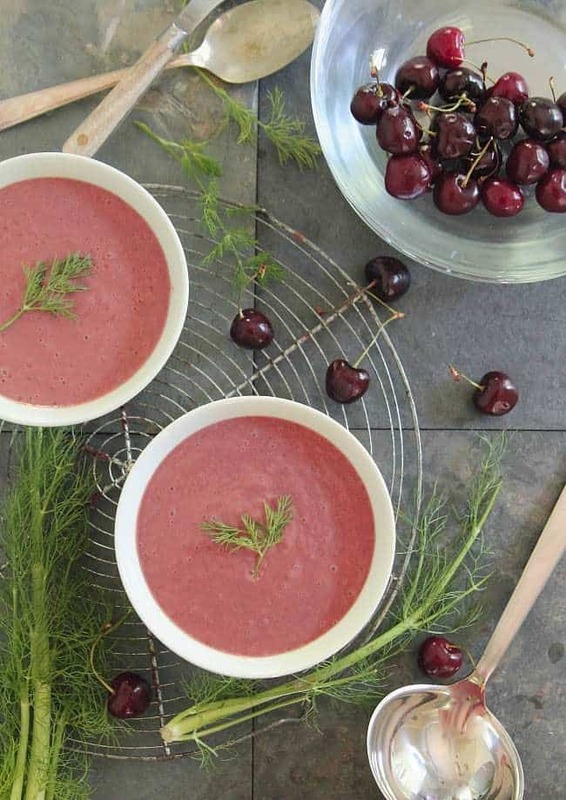 Whether that’s making homemade ice cream, enjoying some s’mores around a campfire, or pitting cherries for a chilled summer soup, we could all do a bit better at savoring the simple pleasures of summer. Add fennel, shallots, garlic and salt & pepper. Saute for 6-8 minutes until softened. Transfer fennel mixture to a blender and add remaining ingredients. Blend until smooth, transfer to a bowl and refrigerate until chilled. *This post is sponsored by Mightynest. All opinions, content and photography are my own. Thanks for supporting the companies I choose to work with! I feel you on the cherry front. I have a pitter and still get anxious at the very thought of sitting still while pitting. This soup looks amazing. Perfect for summer. Love this flavor combination, it’s so interesting! And the chilled soup is SO perfect for those hot as heck days we’ve been getting. So refreshing. What a brilliant flavor combination! I may have to try this in salad form, with shredded fennel, halved cherries, and a buttermilk dressing. So good! Looks delicious and the colour is gorgeous Gina!